Inverter generators are gaining more and more popularity and for plenty of good reasons. Inverter generators are wonderful tools to have on hand in case of power outages, storms, or natural disasters such as hurricanes or floods when you might find yourself out of power and in need of some to power up your home. Inverter generators are also fantastic products to have on hand in your garage, especially if you like to take on lots of construction or do it yourself style projects. Having a generator on hand will make things easier by giving you plenty of power to use tools, lawn mowers, or even lights. Again, this can be useful in case of emergencies, but it is also ideal to have on hand for everyday use, as you never know when the power might be down and you will need electricity. This article is going to cover the best 3000-watt inverter generator for the money, taking you through what exactly an inverter generator is, how they work, the difference between an inverter generator and a regular generator, and what a 3000-watt inverter generator will run. After, we will talk about specific models of 3000 watt inverter generators and finally come to the conclusion about what is the best 3000 watt inverter generator for your money in 2019. 1 What is an Inverter Generator? 2 What is the Difference Between a Generator and an Inverter Generator? 3 What Will a 3000 Watt Inverter Generator Run? 5 How Does an Inverter Generator Work? Inverter generators haven’t been around too long; in fact, they are a recent addition to the generator lineup. Inverter generators are increasing in popularity due to the fact that due to their inverter technology, they can actually keep a constant flow of electricity to whatever you are powering. This is done by the generator creating your typical AC power, converting it to DC power, and then inverting it back into AC power that is cleaner and more consistent. While all generators are known for their ability to create mechanical energy and then take that energy and convert it to electric energy, an inverter generator does things a bit differently. What is the Difference Between a Generator and an Inverter Generator? An inverter generator can make electricity just like a regular generator can, but it can do so in a more powerful, quieter manner that can end up being way more useful to the person who purchased the generator. For example, while a single rotation of the motor in a conventional generator can produce a single block of AC power, an inverter generator can actually produce more than that – making it pretty much as powerful as a wall outlet in your home. Inverter generators are also much quieter than regular generators. In fact, they can be so quiet in comparison, some people have noted that they can actually carry on a conversation while they are standing right next to an inverter generator! They also tend to be a lighter weight than traditional gas generators, making them more portable and easy to carry in case of emergencies. What Will a 3000 Watt Inverter Generator Run? Inverter generators can power all sorts of things that you use each and every day, and things that you might not even think of needing in case of a time when you don’t have any power. But you might find yourself wondering exactly what a 3000-watt inverter generator will actually run. A 3000-watt inverter generator can run all sorts of things – including things like a chest freezer, a refrigerator, an electric skillet or hot plate, a microwave, lamps – a lot of things that you find yourself using every day and things that you might wish you had when the power goes out! While a 3000 watt inverter generator can power these things successfully and last a while, you have to be aware that if you are using the inverter generator to power more than one thing, the wattage and amount of electricity will split, so using a single inverter generator to power several things at once isn’t likely to work out well. If you have a very large assortment of things that you may need to be powered, it might be beneficial to get more than one inverter generator, or to make sure you prioritize (for example, keeping the generator running so that the refrigerator stays cold is a lot more important than using the generator to power up a hairdryer!). This will help to make sure that your inverter generator lasts longer and the power is going toward the things you actually need most. If you decide to choose an inverter generator, you might be wondering which model would be the best. There are a lot of different brands and models of inverter generators to choose from, and picking the best one based on all of those options might seem daunting, so it can be helpful to get a good, in-depth look at what each generator has to offer and how it can be beneficial to you. Here we are going to take a look at several of the top inverter generators of 2019, see what they offer, and pick the top choice at the end of the article. The Honda Super Quiet Gasoline Portable Generator with Inverter (EU3000IS1A 3000 Watt Electric Start Inverter) gets its place as being the best inverter generator of 2019 due to all of its features and specs that are sure to impress. 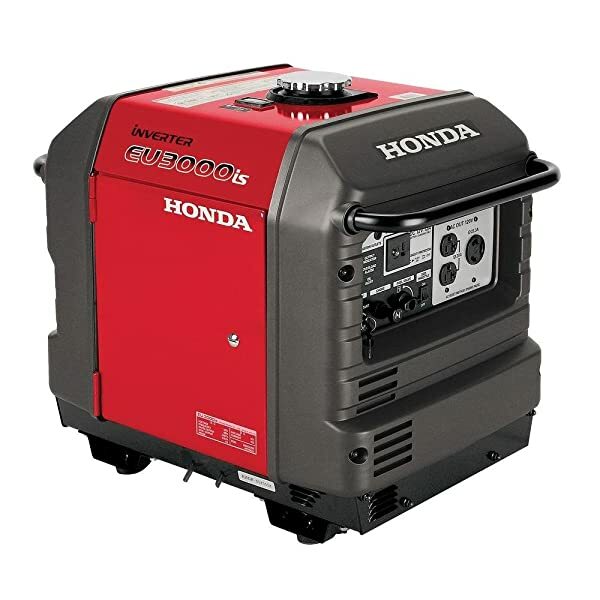 This inverter generator, made by Honda, which is known for their high-quality generators, is one of the most fuel-efficient inverter generators out there, with a run time of up to twenty hours on a small amount of gas – only 3.4 gallons will get you almost a full day’s worth of power, depending on how you are planning on using it. The amazingly simple electric start feature is convenient, allowing you to get it running quickly and effortlessly, and the inverter generator is so quiet you can use it in a neighborhood setting – your neighbors won’t be complaining about it! The Honda Super Quiet Gasoline Portable Generator with Inverter offers the ability to power a wide assortment of items, such as RV air conditioners, refrigerators, freezers, even a fan on a gas or oil powered furnace in your home. The advanced technology featured with this generator will also provide you with many hours’ worth of stable power for you to use to power electronics, such as a laptop, computer, or even a small television. The manual pull cord start is also available in case of an electronic start failure, and the gas inverter generator weighs in at roughly forty-five pounds, making this incredibly lightweight and perfect for home use or traveling. The WEN 56310i-RV Super Quiet 3100-Watt RV Ready Portable Inverter Generator Carb Compliant is one of the best inverter generators for the money. With a fantastic price point that makes this inverter generator a favorite, this WEN model is also incredibly portable, making it perfect for RV travel, boat travel, or having in the garage in case of a power outage at home. The generator offers a super quiet operation, so you can rest assured that it will not disturb neighbors or family members, making this a great generator to have running in a neighborhood setting or even somewhere like an RV park or for tailgating. In fact, the generator is so quiet that it meets both EPA III and CARB compliances. Rather than producing the kind of power that is found with traditional gas generators, this inverter generator produces only clean power, making it ideal for electronics such as laptops, computer, televisions, and even smartphones and tablets. The WEN generator offers various ports for power, including two 120V ports that are each three-pronged, a single 120V AC 30A RV plug, a single 12V DC receptacle, and two 5V USB ports, which are perfect for you to use to power up your electronics or charge your cellphones. The generator weighs 81.4 pounds, and the two-year warranty included with this generator is sure to give you some peace of mind. The fuel tank has a capacity of 1.87 gallons, and when used to power half of its capability, it has a run time of just over seven and a half hours. A 212 cc four-stroke OHV engine powers the generator, which also has an eco mode to help cut down on energy use, making it perfect for those who are environmentally conscious. If you have a travel trailer, you might very well be looking for a generator that can help you in case of running out of battery power in your vehicle or just in case of an emergency and you would like to have a backup inverter generator packed away. The best inverter generator for a travel trailer is definitely this Champion 3100 watt RV Ready Portable Inverter Generator with Wireless Remote Start. Not only is Champion a great name when it comes to generators, but you will also find the remote start function to be a real time saver, giving you the option to start up the inverter generator from up to eighty feet away by simply using the included remote key fob. You can also use the key fob to stop the generator, so you don’t need to go outside your travel trailer to get it going! The simple touch panel on the outside of the generator also features a three-position ignition switch in case you choose not to use the key fob. The 60 HZ. clean power offering on this generator makes it a breeze to safely power sensitive electronics such as cell phones, televisions, and laptops, while still offering enough power to power other items, such as refrigerators and microwave ovens. 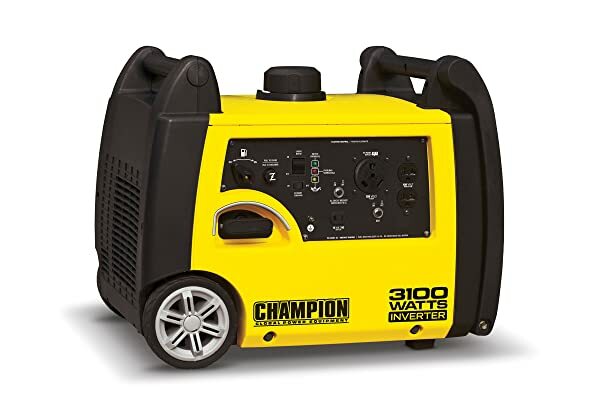 The Champion portable inverter generator has a start-up power of 3100 watts and a running power of 2800 watts, making it ideal for all of those different appliances. The generator is also ultra quiet, operating at only 58 dBA, and has options such as a standard RV plug that make it perfect for travel trailers. With a twenty-five percent load, you can run this generator up to about eight hours, and the fuel tank in the generator has a 1.6-gallon capacity. With a three year limited warranty and free lifetime support, you can rest assured that you are in good hands when you purchase this portable inverter generator from Champion. The cast iron sleeve and low oil shutoff mechanism make this ideal for traveling because of its durability. 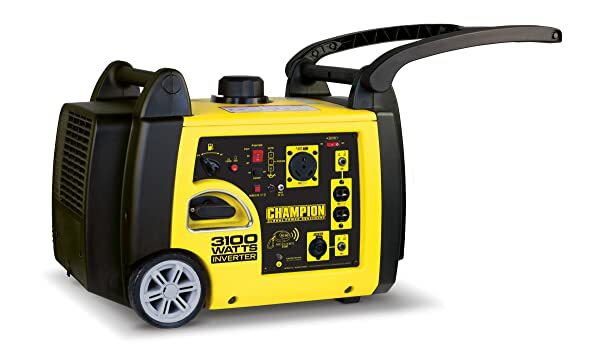 If you don’t need a large inverter generator and are looking to purchase something smaller (which also makes it ideal for keeping with you for travel, boating, or RVs), the Champion 3100 Watt RV Ready Portable Inverter Generator is one that should definitely be on your list! 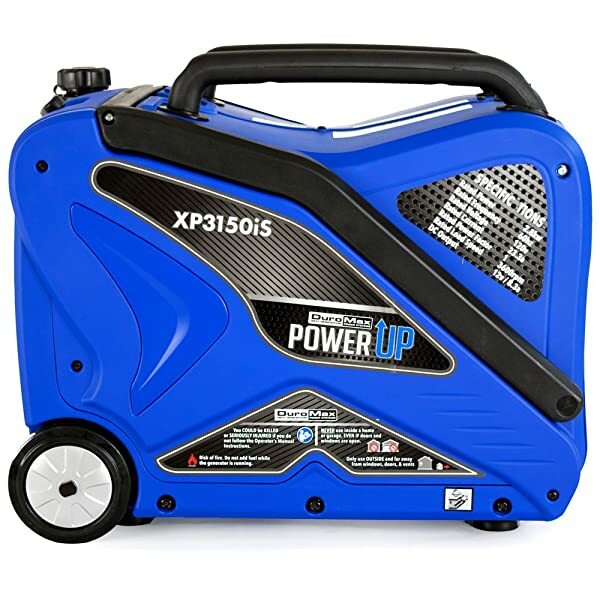 The smaller size of this generator makes it perfect for travel, work, or even having it on hand in case of emergencies, and the durability of the inverter (thanks to the cast iron sleeve and never flat design wheels) make it super easy to have on hand. 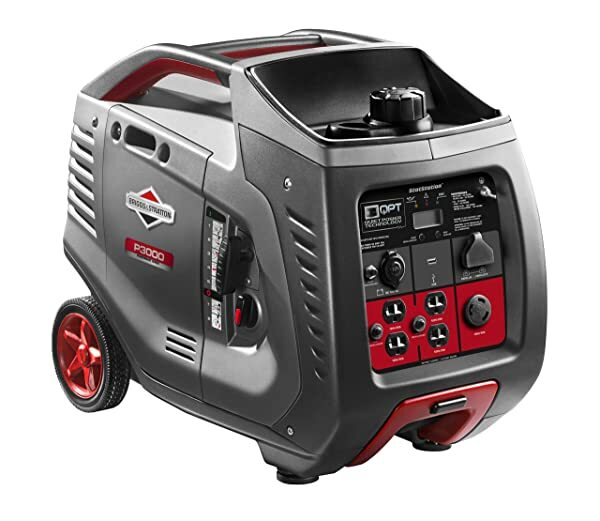 Other features of this Champion portable inverter generator include a low oil shutoff mechanism, which is helpful in case you run low on oil and don’t realize it, saving you from damaging your generator. The recoil start makes getting the generator going easy, and at 58 dBA in terms of sound, you can sleep easily with this super quiet noise levels. The 3100 starting watts and 2800 running watts provide enough power to keep going for up to eight hours when operating at twenty-five percent capacity and is enough to power all of your important appliances and electronics, including cell phones, tablets, and laptops. The quick touch front panel makes taking along and using this generator simply a breeze! A wonderful brand name, this Briggs & Stratton 30545 P3000 PowerSmart Series Portable 3000 Watt Inverter Generator with (4) 120-Volt AC Outlets and (1) 12-Volt DC Outlet is a great inverter generator to have on hand in case of emergencies! With a super long run time – up to ten hours when only operating a quarter load, this generator, which has 21.7A running amps, is the perfect generator to take with you for RV travel or simply keep in the garage in case of a power outage or bad weather conditions. 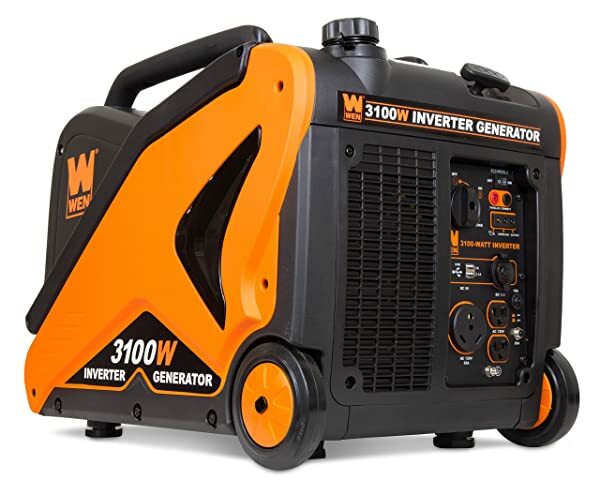 With engine speed of 30545s, this generator is super quiet and efficient, allowing you to power multiple items (as well as offering clean power for laptops, cell phones, and tablets), and keep going when you need it most. In fact, this generator is so quiet, it has been known to be fine to take camping with you and is quieter than a traditional camping generator! A 1.5-gallon fuel tank is inside this generator, which gives you plenty of time for use. With 3000 starting watts and 2600 running watts, this generator gives you all the power you’ll need for all of your adventures. An easy to read LCD display gives you a heads up on your generator’s stats, allowing you to keep tabs on what’s going on, including the fuel levels when there is a problem, and how much time you have left at your current load. 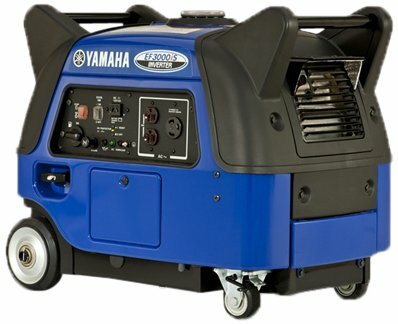 With six inch wheels, this generator is perfect for taking along with you. The four household-style power outlets and single 12-volt outlet give you plenty of room to plug in all of your necessities. While there is no electric start on this model of inverter generator, the manual start makes getting this up and running easy as can be. Yamaha’s EF3000iS is designed with sound absorption in mind. It was made with sound absorbing materials situated in key locations. It also does not resonate sound, making it an efficient and quiet inverter generator that will assure quality time with families or friends without minding any noise from the equipment. 3,000 starting wattage and 2,800 running wattage. DuroMax, which is one higher end brand of generator, is the perfect generator to add to your home, tailgate party, or RV. This generator is ultra portable thanks to the handle and never flat wheels. It is very lightweight, weighing in at only seventy-seven pounds, making it easy to take along with you wherever you go. The generator has 2800 running watts and 3150 startup watts. The sleek and minimal design makes this generator look different and attractive above other models, and the case keeps it secure and safe from bumps and falls. You can easily connect this generator to another of the same model, giving you more power. The 2.3 gallon gas tank can have you running the generator for up to nine hours at half capacity, which is plenty of time to watch the game at a party or run essential household items in case of a power outage! If you’re new to inverter generators and don’t know very much about them, you might be wondering exactly how these interesting devices work. Interestingly enough, inverter generators are both simple and complicated at the same time, so it might feel like it’s a bit daunting to learn all about them. Let’s take a look at exactly how inverter generators work. Regular gas generators work by converting mechanical energy to AC energy. This is helpful, especially in times of emergency, because it gives you the ability to run appliances, tools, and even power cell phones and tablets, allowing you to have that sought-after peace of mind. While traditional gas generators are amazing for this, they do have their drawbacks, including interruptions in the flow. Inverter generators, on the other hand, offer quieter, more reliable electricity to your most important electronics, tools, and appliances. Inverter generators work by taking the flow of electricity, converting it from AC electricity to DC electricity, and then taking that DC electricity and converting it back into AC, the only cleaner. This makes it more reliable, and also gives off a much quieter sound. The cleaner energy that the inverter generator creates makes it much more efficient, and also gives you the ability to power more and last longer than the traditional gas generator’s electricity flow. It’s a win, especially if you have a lot of important things that you need to power in case of an emergency! In conclusion, an inverter generator is never a bad item to have on hand, whether you plan on traveling in your boat, car, or RV with it, or whether it’s something you would love to have on hand during emergencies, bad weather, or power outages. Since an inverter generator works by taking traditional AC power, converting it to DC power and then back into a cleaner AC power, you can power up just about anything you can think of that you might need, including really sensitive electronic devices such as cell phones and tablets, without worrying about damaging them, as you might with a traditional gas generator. Above is a great list of the best inverter generators of 2019, including suggestions for what each generator is best for. For example, if you are looking to make a great investment with your inverter generator purchase, choosing the EU3000IS1A Honda model is a great idea, as it comes with plenty of bells and whistles and is sure to last you longer and give you more useful than a cheaper, lower brand. If you want to get a long life out of your generator, it is good to know that you essentially will get out of it what you put into it, so be sure to choose something that is going to last you a really long time! If you are looking for a generator with a more reasonable cost that will save you plenty of money, the WEN 56310i-RV model is definitely the way to go. This high powered model is a great way to get more bang for your buck. When choosing an inverter generator, it is important to keep in mind exactly what you are hoping to get out of the product. When you do figure out what works best for you, taking care of your generator is the next best step. Since so many are made with materials that make them almost indestructible, it is easy to keep it in tip-top shape! Since I like my tools to be as quiet as they can be, I prefer an inverter generator. It’s hand down the better option for other reasons as well. I have a neighbor that has a Briggs and Stratton (don’t know which model) and it’s not nearly as quiet. He gets complaints about it all the time. You can’t go wrong with the Honda EU3000IS1A. We’ve had Honda generators for decades in my family and they always lasted a long, long time and did their job very well. If every product was as good as Honda makes their generators our world would be so much different.